When you enter any fairground obviously it's an essential to grab your burger or hot dog with a soft drink and some glorious candy floss to finish it off. Once you’ve been on enough rides to make you think you have whiplash you’ll finally head down to the most iconic fair game around, ‘hook a duck.’ Ah yes, you know that game whereby if you manage to hook one of the ducks you win a cute cuddly toy or a goldfish that’s been living in a plastic bag of water for the past week and has one day left to live. Well the team at Eyecon have said enough is enough and have created a new ‘hood a duck’ game in the form Double up Ducks Jackpot. 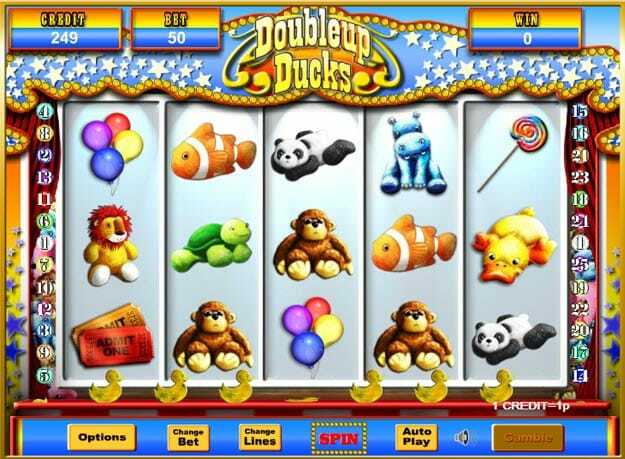 A progressive Jackpot version of Double Up Ducks slots that pays out a prize worthwhile. Eyecon as you probably know are responsible for a huge chunk of all that’s great about online slots. Eyecon’s team of professionals are dedicated to brainstorming only the best ideas for game themes, these conveyer belt of ideas are constantly moving forward subsequently turning into online games that immediately grip the target market of Eyecon. Their variety of ideas in production shows they can produce high-quality games to suit everyone’s taste, Double up Ducks Jackpot is a brilliant example of this as it boasts an iconic theme that is recognised by everybody, therefore, all punters want to give this game ago. 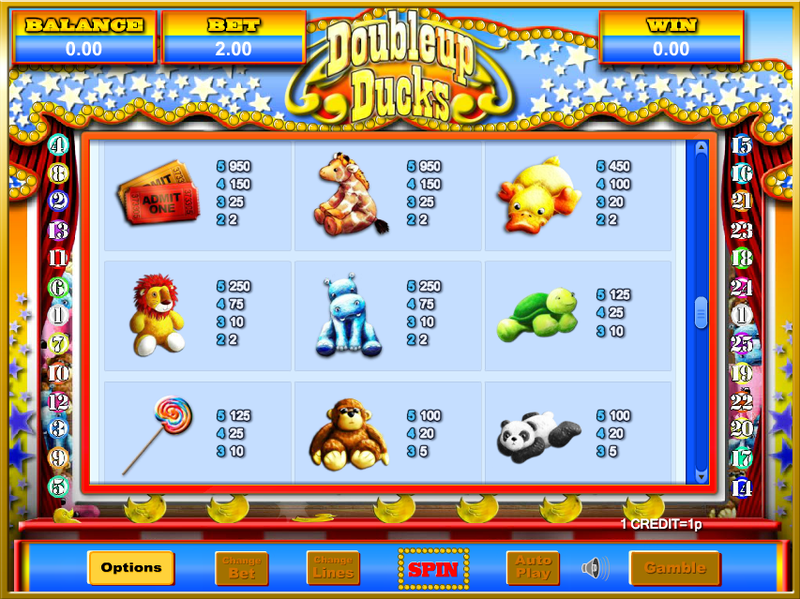 Double up Ducks Jackpot is a 5-reel 25 pay-line that is a Progressive Jackpot, the game itself carries a proper fairground theme with all the symbols on the reels displaying what you would expect to see at any fairground. Turtles, Gorillas, Pandas, Lions, Hippos, Giraffes, Elephants and of course Fish and Ducks. Bubblegum, tickets and lollipops are also included as symbols on the game. Double up Ducks Jackpot allows you to select the number of credits you wish to have per line, this ranges from 1,2,3,5,7,10,15,20,25 or 30. You can change this by clicking the ‘change bet button.’ For picking the line quantity between 1 and 25 you can control this by clicking the ‘line-up’ and ‘line down’ buttons. Max lines and max bets are also optional for you to use as are auto-plays which you will earn 10, 20, 50 up to 100 completely automatic spins that require no control. Look out for the wild symbol which is the pink elephant that can substitute all symbols in the game but the scatter symbols. This is the highest paying symbol in the game. This is a truly magnificent progressive Jackpot game that has taken off due to its famous and creative theme which so many of us can relate to. An exciting game that brings back that nostalgia of being a child again and going down to the fairground in the hope of winning a game and bringing back a prize.